Approximately every two years our CCNet Rallies provide an opportunity for the Conservation Coaches Network community to connect, share innovations, sharpen our skills, and uplift our spirits to support conservation practitioners and projects to do better, smarter conservation all around the world. 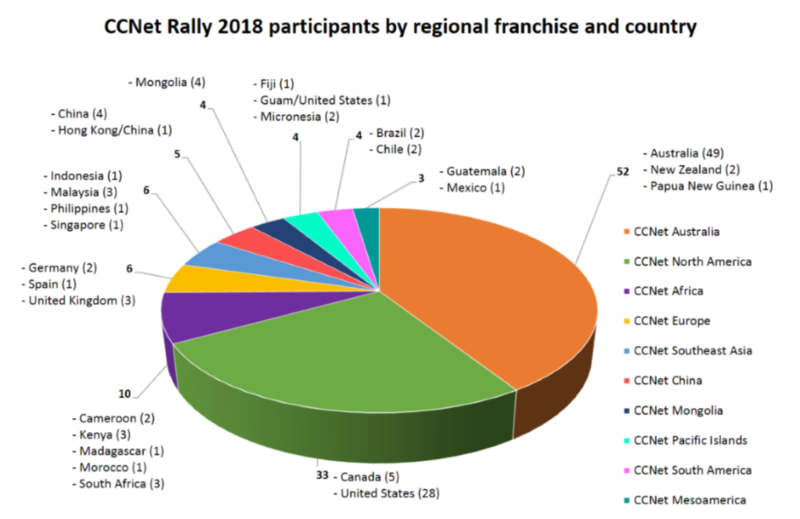 This year we held our seventh CCNet Rally from April 30 to May 3, 2018 in the stunning Blue Mountains in New South Wales, Australia. 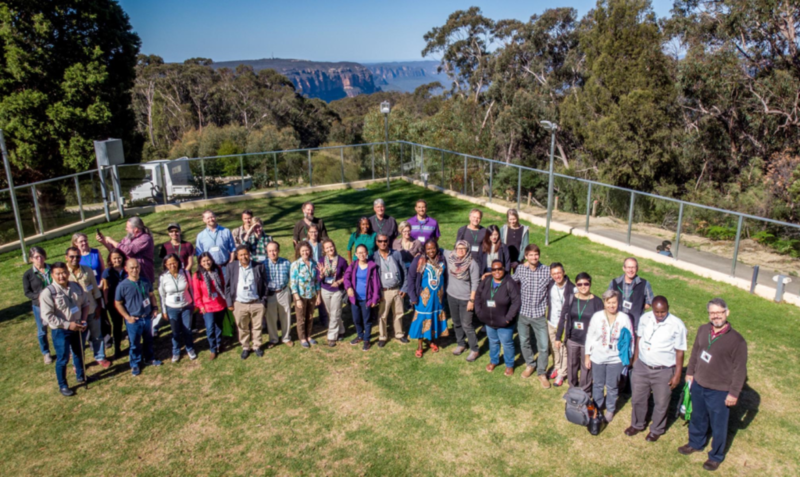 The CCNet board supported Australia as this year’s gathering place in order to foster participation from within the region and adjacent regions. This year our community event focused on Building Resilience and Working Together. Thanks to a hard-working, enthusiastic voluntary planning team and help from coaches around the world, we offered diverse activities, such as plenary events to expand our horizons and inspire us to continue adapting to the world’s needs; workshops to hone existing and new skills; working group sessions for sharing approaches, exploring specific problems, and developing guidance; bushwalks with aboriginal owners and local experts and unstructured time to foster networking. At CCNet we have a motto that is the heart of our community: learn it and pass it on. Generosity is what fuels our community, and the Rally provides a golden opportunity for all participants to engage and actively contribute to strengthen each other to do better conservation. This year the program included 24 interactive sessions, all led by peers, for peers. Networking and collaboration began many months before the event, as coaches worked together virtually while they bridged organisational, geographic, cultural, linguistic, generational and time-zone boundaries. In many cases session leaders met each other in person for the first time once they arrived at the Rally. After Aunty Leonie Trindall from the local Gundangurra People welcomed us all to Country with a beautiful smoke ceremony, we had our opening plenary talk which included a welcome from local hosts by Greening Australia’s CEO Brendan Foran and opening words by CCNet’s Board Chairperson Brad Northrup. 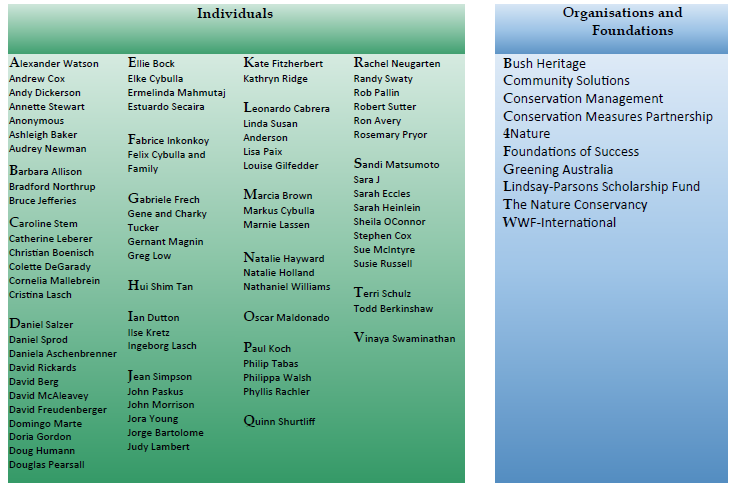 John Morrison, WWF-US and also CCNet’s Global Coordinator shared a progress report on our network. Closing our welcome plenary we had a special video by Dame Jane Goodall, world-renowned anthropologist and primatologist and United Nations Messenger of Peace. Jane Goodall reminded us that in spite of the many challenges our wold faces, there is reason for hope, and pointed out how important it is to improve human livelihoods as we protect nature, and also that involving youth in conservation decisions is of utmost importance so that they can be responsible and successful stewards of our planet. In a case study, colleagues Galbadrakh Davaa from TNC-Mongolia and Munkhchuluun Basan from WWF-Mongolia shared an example of how their organisations are working together with government agencies and residents in a landscape approach to help the wide-ranging nomadic gazelle adapt to climate change in Mongolia. In this year’s keynote talk, Stephanie Russo from the National Australia Bank and Tim Moore from Biodiverse Carbon Conservation, Greening Australia’s joint venture company, opened our howizons with interesting insights into how we could unlock greater collaboration and financial support opportunities by having a clearer sense of what value stack can be provided by each project, and in general by integrating valuation into our work. In the closing plenary colleagues Annette Stewart from Bush Heritage Australia, Tom Vigilante from the Wunambal Gaambera Aboriginal Corporation and Bush Heritage Australia, and Stewart Cowell from Conservation Management shared an engaging and impressive story about how the Open Standards have been adapted and adopted in Australia to support a wide array of stakeholders and territories, helping Traditional Land Owners care for immense ancestral land– and sea-scapes, connecting areas and guiding restoration efforts at scale, while also informing decision-making at an organisational-scale. Getting Ready for the Emerging Future: What Skills and Knowledge Do We Need to Strengthen? Fostering connections is an important part of our Rallies, and in addition to the networking that began as we prepared for our big community event and the bushwalk options with aboriginal and local experts to explore the beauty of the Blue Mountains, the Tools and Innovations Bushwalk offered an informal and fun space for colleagues to meet, share their passions, and learn about tools, methods, and ideas. At the party evening we also recognised four colleagues with a CCNet Global Service Award: Felix Cybulla, Marcia Brown, Annette Stewart and Oscar Maldonado. And for their Outstanding Contribution to the Practice of Conservation CCNet Australia and CCNet Global recognised the Wunambal and Gaambera People and Frank Weisenberger with an award. 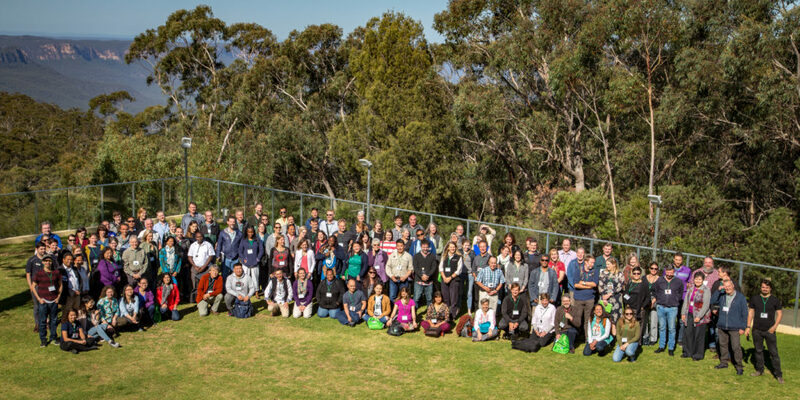 At CCNet this year we piloted a certification programme, and the first cadre of Certified Conservation Coaches was also announced, including: Felix Cybulla, Nick Salafsky, Oscar Maldonado, Philippa Walsh, Ilke Tilders, Robert Sutter, John Morrison and Stuart Cowell. This year’s joint CMP-CCNet Adaptive Management Case Study Competition winners were also announced at the Rally: First Place was awarded to The Road Traveled in Chile: Lessons and Challenges in Strengthening Adaptive Management in a National System of Protected Areas; Second Place was awarded to Proyecto Titi for the project, Using an Adaptive Management; and Third Place went to Bush Heritage Australia, for their use of the Open Standards in communicating the planning, management, and monitoring of Yourka Reserve – A Unique Tropical Savanna Ecosystem. 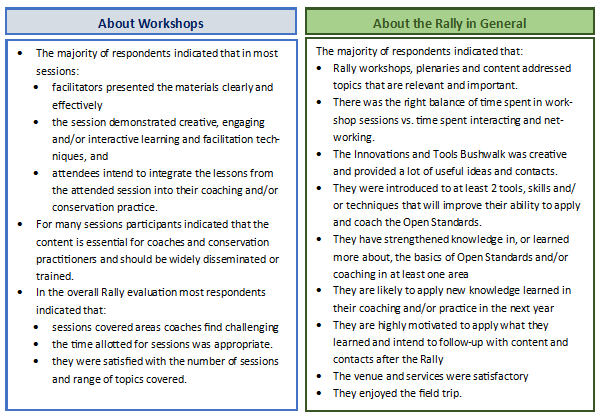 What did participants think of the Rally? The feedback we received both from the final event evaluation and session evaluations was very positive. Rally participation was significantly bolstered by the generous contributions of sponsors and supporters. 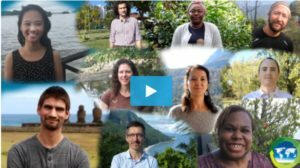 We launched our first Crowdfunding campaign on Chuffed.org with Australian organisation 4Nature and raised AUD$7,472 that were donated by people from the following 17 countries: Australia, Austria, Canada, Demoncratic Republic of the Congo, Dominican Republic, France, Germany, Guatemala, Malaysia, Mexico, Netherlands, New Zealand, South Africa, Spain, Sweden, United Kingdom, and the United States of America. We also received additional donations that enabled us to cover a large portion of event costs and directly assist over 60 participants with attendance costs. Generosity is the fuel of our Network, and we are very grateful to everyone who attended and contributed their talents, ideas, hard work and joy! Special thanks to our sponsors and friends who made our seventh CCNet community gathering possible.